Just when you think that Apple is coming to the end of a long iOS beta program, it starts all over again. With iOS 9 set to arrive on public iPhones and iPads next week, developers received the Golden Master release on September 9th, and a day later those on the Public Beta Program also received a new beta to test. But it’s not iOS 9. 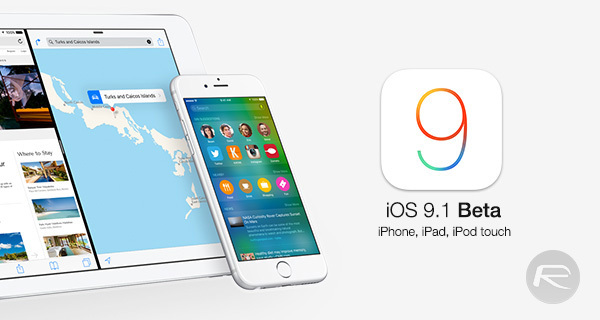 When the iOS 9 GM went live following Apple’s media event, the company also seeded the first developer beta of iOS 9.1. Now, that same beta release is available for anyone to try, so long as they are registered with Apple Public Beta Program. To do that all a person needs to do is enroll their iPhone or iPad on the Apple Public Beta website, install a profile, and then reboot their device. If all went according to plan, iOS 9.1 should then appear as an available update via Settings -> General -> Software Update. You can find full instructions on the procedure here. At this point we don’t know too much about iOS 9.1, other than it includes a host of new emoji, including one for middle finger, as we told you recently. iOS 9.1 is also the software that the recently announced but as-yet not shipping iPad Pro will come pre-installed with. That means that support for the new iPad and all that entails is here in iOS 9.1’s first beta, and developers will want to dig into the new tools they now have to work with in order to support the new, oversized iPad. As for installing iOS 9.1’s first beta release on your existing device, that’s very much your choice to make. We’re not sure we would be rushing to do it ourselves, especially given the arrival of iOS 9’s GM build. However, we have heard that iOS 9.1 offers some considerable speed improvements over even the GM build of iOS 9, though your mileage may vary. If you do opt to give iOS 9.1 a try at this point though, just make sure you’re all backed up first! I installed this just a little while ago over iOS 9 GM and I can say that the speed boost is noticeable. GM was a bit laggy, this Public Beta made it better. Not to mention getting the Middle Finger Emoji. You’ll have to downgrade from 9.1 Beta 1 to iOS 9. The GM that is slow and laggy will basically be the same as the final that they will release next week. So if I were you I’d stay on 9.1 Beta. I am. Until I get my 6S Plus. I cannot install this update (i’m on 9.0 public beta) OTA. Now I will try to download the IPSW (from torrent). wat website torrent you dload? kicks only 5 seeds. Again I will wait for Wednesday for the Public release!